On June 19, 2014, the U.S. Supreme Court handed down its first software patent case in thirty-three years. In the case of Alice Corp. Pty. Ltd. v. CLS Bank, the Court determined the patent eligibility for computer-implemented inventions. While incorporating its previous analysis of Mayo Collaborative Services v. Prometheus Lab., Inc., the Court verified that computer-implemented inventions have protection through patent subject matter eligibility; however, the Court limited this protection by finding that generic computer implementation must further transform an abstract idea to be a patent-eligible invention under 35 U.S.C. § 101. The ruling of Alice is significant as it replaces the once general view held by the courts that §101 was nothing “more than a ‘course [patent] eligibility filter’” with a defined patent eligibility filter derived through a two-part analysis that has placed patentability under Section 101 at “a higher bar.” It has not only been the courts who have taken notice of Alice. The USPTO issued advisories and instructions for its examiners and the public at large as to the handling of patent eligibility for software patents and denied pending patents upon the issuance of Alice.The impact of Alice is broad but it appears to be a decision that was long overdue to address the many issues facing patentability of subject matter eligibility in various arenas where such issues are dominant. The facts in Alice derive from the assignment of several patents from Sywcho Infrastructure Services Pty LTD to the petitioner Alice Corporation Pty Ltd.The assigned patents related to a computerized scheme for mitigating settlement risk. Specifically, the patents were designed to facilitate the exchange of financial obligations between two parties by using a computer system as a third-party intermediary to manage certain forms of financial conditions.Upon receipt of the information, the intermediary would take the data and notify financial institutions to facilitate the approved transactions. Observing that it has for 150 years heldan implicit judicial exception for patent ineligibility for “laws of nature, natural phenomena and abstract ideas,” the Court noted “this exclusionary principle as one of pre-emption.” In further explanation, the Court stated that laws of nature, natural phenomena, and abstract idea are “the basic tools of scientific and technological work” and that the “‘[m]onopolization of those tools through the grant of a patent might tend to impede on innovation more than it would tend to promote it,’ thereby thwarting the primary object of the patent laws.” Hence, the Court concluded that a distinction must be made between patents that claim the building blocks of human ingenuity, which “would risk disproportionately tying up the use of the underlying ideas,” and those patents that remain eligible by integrating the building blocks into further innovation. Second, if so, whether the claim contains an inventive concept sufficient to transform the claimed abstract idea into a patent-eligible application. Applying the first step, the Court held that the claims were drawn to abstract idea of intermediated settlement. Relying on its previous decision of Bilski, the Court noted that such ideas used by Petitioner’s patent are “fundamental economic practice long prevalent in our system of commerce and taught in any introductory finance class.” Similarly, “intermediated settlement” like hedging in Bilski, is an “abstract idea beyond the scope of § 101.” The Court rejected Alice’s argument that “abstract–ideas category is confined to ‘preexisting fundamental truths’ that ‘exist in principle a part from any human action’” further confirming the similarity to Bilski. (4) Issuing irrevocable end-of-day instructions to the exchange institutions to carry out the permitted transactions. In December 2014, the USPTO issued further instructions under Alice with a caveat that all claims were to be fully examined under each of the other patentability requirements. 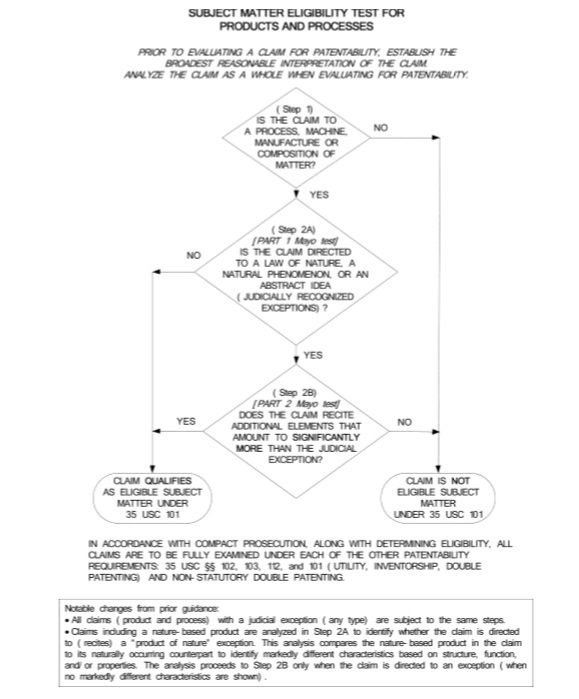 As further instructions, the USPTO established a two–part analysis for Judicial Exceptions Flow Chart based on Alice.See Illustration 1. Effecting a transformation or reduction of a particular article to a difference state of thing. As reflected in the summaries provided by USPTO, the courts themselves have implemented Alice by often referring to the two-part analysis as the Mayo/Alice framework. Overall, it appears courts have demonstrated that they will evaluate software claims utilizing the framework established by the Supreme Court while being “careful to avoid allowing the typically convoluted claim language--‘patent-ese’ to obfuscate the general purpose and real essence of software patent claims.” However, some courts post–Alice have found eligibility based on being an inventive concept.In a recent study of the top federal courts with the most patent filings by California State University Long Beach, the impact of Alice was examined as to dismissals of actions based on Alice. Notably, over 7000 patent cases filed with federal courts were examined from June 2013 through June 2014 and from June 2014 through June 2015. Overall, the study found that there was a significant drop of patent infringement filings in all but two districtsand a recognizable increase of Alice motions based on under either a Motion to Dismiss pursuant FRCP 12 (b)(6) or Motion for Judgment on the Pleading pursuant to FRCP 12(c). The most common basis for denial of a these pre-trial motions was based on the motions conflicting with the claim construction process, which is a pre-trial motion used in a patent infringement case to define the scope of property right being enforced in the lawsuit. While this appears to be a valid basis for denial of a motion based on Alice, it would appear that an Alice analysis would eliminate the need for a claim construction. Notably, the Eastern District to Texas, which has the highest patent filings in the country, recently adopted a new standing order with reference to letter brief requirements to address the numerous Alice motions filed in this court. Previously, most Alice challenges were dismissed without prejudice until a claim construction was facilitated; however, this recent order may be an indication that Alice challenges could become as routine as other pre-trial motions in patent cases. The impact of Alice is vast. It is apparent that defense attorneys have fully embraced Alice by the influx of pre-trial motions challenging patents claim. Moreover, there is some showing of decrease of patent infringement lawsuits. However, whether companies will no longer be challenged in court by a patent assertion entity (PAE), patent holding company (PHC) and non-practicing entity (NPE) or “patent trolls” is still questionable. Even if they are challenged, is Alice enough? Will further legislative action be warranted to provide a different type of protection? While time will provide these answers, the Supreme Court was clear that the broad language of § 101 would still grant software developers protection but the two-part test in Alice has narrowed the scope of that protection. Software developers now have the burden of proving their claims provide substantially more and that burden cannot be overcome by creative writing. Therefore, it is important to observe the recent rulings as well as the USPTO’s illustrations to determine eligibility prior to seeking patent protection. Alice Corp. Pty. Ltd. v. CLS Bank Int’l, 134 S. Ct. 2347 (2014). Mayo Collaborative Servs. v. Prometheus Labs., Inc., 132 S. Ct. 1289, 1293 (2012). Research Corp. Techs., Inc. v. Microsoft Corp., 627 F. 3d 859, 869(Fed. Cir. 2010). Enfish, LLC v. Microsoft Corp., 2014 WL 5661456 at *2 (C.D. Cal. Nov. 3, 2014). SeeDirector’s Forum: A Blog from USPTO’s Leadership, United States Patent and Trademark Office(Aug. 4, 2014), http://www.uspto.gov/blog/ (hereinafter “Director’s Forum”); see alsoMemorandum from Andrew H. Hirshfeld, Deputy Comm’r, USPTO, to Patent Examination Policy, U.S. Patent & Trademark Office, to Patent Examining Corps: Preliminary Examination Instructions in View of the Supreme Court Decision in Alice Corp. Pty. Ltd. V. CLS Bank Int’l, et al. (June 25, 2014), available at http://www.uspto.gov/patents/a... 25jun2014.pdf (hereinafter “Memorandum from Andrew H. Hirshfeld”);2014 Interim Guidance on Patent Subject Matter Eligibility,79 Fed. Reg. 74618 (Dec. 16, 2014)(to be codified at 35 C.F.R. pt. 1). For the purposes of this case, the Supreme Court focused on U.S. Patent Nos. 5970479, 6912510, 7149720, and 7725375. Alice Corp. Pty. Ltd. v. CLS Bank, Int’l, 134 S. Ct. 2347, 2523 (2014). Bilski v. Kappos, 561 U.S. 593 (2010). Alice, 134 S. Ct. at 2523. Id. (finding that seven of the ten participating judges agreed that the petitioner’s method and media claims were patent ineligible with a plurality of the panel relying on Mayo). Alice, 134 S. Ct. at 2354 (citing Bilski, 561 U.S. at 601-02 (2010)); see also O’Reily v. Morse, 56 U.S. 62 (1853); Le Roy v. Tatham, 55 U.S. 156, 174-75 (1853). Alice, 134 S. Ct. at 2354 (citing Bilski v. Kappos, 561 U.S. 593, 611-12 (2010) (upholding the patent “would pre-empt use of this approach in all fields, and would effectively grant a monopoly over an abstract idea.”)). Id. (quoting Assoc. for Molecular Pathology v. Myriad Genetics, Inc., 133 S. Ct. 2107, 2116 (2013)). Id. (quoting Mayo Collaborative Servs. v. Prometheus Labs. Inc., 132 S. Ct. 1289, 1293 (2012));see U.S. Const., art. I, §8, cl. 8 (Congress “shall have Power. . . to promote the Progress of Science and useful Arts”). Alice, 134 S. Ct. at 2354-55 (quoting Mayo, 132 S.Ct. at 1294). Mayo 132 S. Ct. at 1298. Alice Corp. Pty. Ltd. v. CLS Bank, Int’l, 134 S. Ct. 2347, 2355-56 (2014). Id. at 2356 (quoting Bilski, 561 U.S. at 611). Alice, 134 S. Ct. at 2356. Id (quoting Mayo, 132 S. Ct. at 1297) (international quotation marks omitted). Id. at 2357 (quoting Mayo, 132 S. Ct. at 1300). Id. at 2358. (citing Diamond v. Diehr, 450 U.S. 175 (1981) (holding that a computerized-implemented process for curing rubber was patent eligible but not because it involved a computer)). Id. at 2358(citing Mayo Collaborative Servs. v. Prometheus Labs.Inc., 132 S. Ct. 1289, 1294 (2012)). Id. (quotingMayo, 132 S. Ct. at 1294) (internal quotation marks omitted). See Directors Forum, supra note 6. See2014 Interim Guidance on Patent Subject Matter Eligibility,supra note 6. Memorandum from Andrew H. Hirshfeld, supra note 6. Id. (citing Molecular Pathology v. Myriad Genetics, Inc. 133 S. Ct. 2107 (2013)). Id. (citing Mayo Collaborative Servs. v. Prometheus Labs.Inc., 132 S. Ct. 1289, 1293 (2012)). Id. (citing O’Reily v. Morse, 56 U.S. 62 (1853)). Id. (citing buySAFE, Inc. v. Google, Inc., __F. 3d ___, 112 USBQ 2d 1093 (Fed. Cir. 2014)). Id. (citing Ultramcial, LLC v. Hulu, LLC and Wild Tangent, __ F. 3rd ___, 112 USPQ2d 1750 (Fed. Cir. 2014)). Id. (citing Dealertrack Inc. v. Huber, 674 F. 3d 1315 (Fed. Cir. 2014)). Id (citing Planet Bingo, LLC v. VKGS LLC __ Fed. Appx. ___ (Fed. Cir. 2014) (non-precedential)). The USPTO provides other samples and factual patterns that readers are encouraged to read 2014 Interim Guidance on Patent Subject Matter Eligibility,supra note 6. Diamond v. Diehr, 450 U.S. 175, 184 (1981). Bilski v. Kappos, 561 U.S. 610, 611 (2010). In re TLI Communications LLC Patent Litigation, 2015 WL 627858 (2015). DDR Holdings Inc. v. Hotels.com. L.P., 773 F. 3d 1245, 1257 (Fed. Cir. 2014) (holding software patent that claimed a process of generating a website with the same content as the host website when a third-party advertisement was selected as an inventive concept); see also Hellios Software, LLC v. SpectorSoft Corp., 2014 WL 4796111 at *17 (D.Del. Sept. 18, 2014) (holding patents related to controlling computer network access and monitoring data associated with Internet sessions were not directed to an abstract idea). Eastern District of Texas and Northern District of California. 2014 Interim Guidance on Patent Subject Matter Eligibility,79 Fed.Reg. 74618 (Dec. 16, 2014) (to be codified at 35 C.F.R. pt. 1).